Thrips | Infonet Biovision Home. (Some species of Haplothrips are reported as pest in South Africa, we do not know if they are pests in Kenya or east Africa. Haplothrips are present in East Africa, but some of them are beneficial (predacious) and we do not know the status on the region. This will have to be reviewed when we finish with the datasheets). [br] When the status of Haplothrips in East Africa has been clarified we could decided if we leave this information on egg-laying habits. [br] Biological pesticides: check with list of Seif [br] FW: Include information on synthetic pesticides? 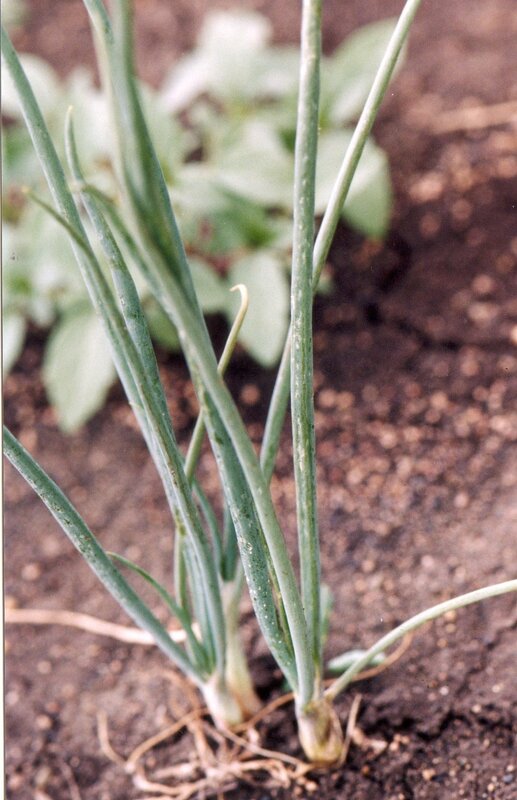 The onion thrips are major pests of onions throughout Africa. The onion thrips attack an extensive range of crops, including cereals and broadleaved crops. They are tiny (1 mm in length), slender and very mobile insects. Adult thrips are pale yellow to brown in colour. Immature thrips are whitish to pale yellow. Both immature and adult thrips pierce the upper surface of the leaves and feed on the plant sap, generally on the developing leaves, deep inside the plant. This results in white and silvery patches on the leaves. The excreta of the thrips are clearly visible as small black dots on the silvery leaves. Severe infestations can cause browning of the leaf tips, slowing of plant growth, distortion of leaves and bulbs, and reduction in bulb size. Although thrips feeding during the early bulbing stage is the most damaging to yields, thrips must be controlled before onions reach this stage so that populations do not exceed levels that can be adequately controlled. 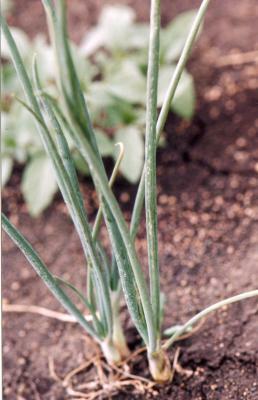 Onions can tolerate higher thrips populations closer to harvest. Thrips infestations are more severe in dry seasons, and entire fields may be destroyed. To prevent infestation, keep plants well irrigated. Dry plants are more susceptible to thrips damage than well watered ones. Remove weeds, as the thrips population builds up on them. Remove heavily infested plant material. For control, neem extracts can be sprayed on attacked plants. However, care should be taken, since some neem preparations, in particular those with high oil content, can be phytotoxic to onions (Schmutterer, 1995). Therefore, when using a neem-based pesticide for the first time, it should be first tested for phytotoxicity on some plants. For more information on neem click here. Also a garlic bulb extract can be sprayed thoroughly on the whole plant, preferably early in the morning. Spraying should be particularly directed to the neck area of the plant for good penetration into the plant.